NEW YORK - The internationally acclaimed Glimmerglass Festival, of the NY based Glimmerglass Opera Company, held its annual National Council Winter Gathering at a private reception in New York on February 15. The Glimmerglass Festival National Council is comprised of major donors, many of whom also serve as ambassadors for the company by hosting Glimmerglass gatherings in their communities. Among the supporters on hand were board chair Dr. Patricia Kavanagh, Susan Taylor and Khephra Burns, and noted jazz vocalist Gregory Generet. 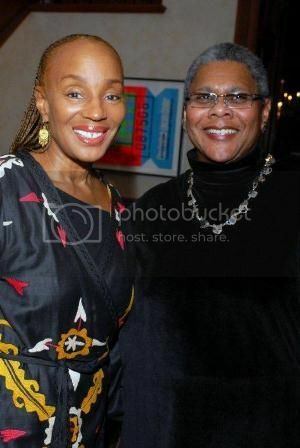 Pictured is Susan L. Taylor, founder of the National Cares Mentoring Movement with Linda Jackson, managing director of Glimmerglass and the first African American to run a professional opera company in the U.S. The evening included a program of French baroque and contemporary music, featuring Glimmerglass artists and singers associated with the company's acclaimed Young Artists Program. Guests were welcomed by Artistic and General Director Francesca Zambello and Managing Director of Glimmerglass Linda Jackson. This year Glimmerglass will feature a number of prominent African American opera singers for its various productions including Aida in which the renowned African-American bass-baritone, Eric Owens, will sing the lead. 2011 Metropolitan International Audition winner Michelle Johnson will sing the title role. Mr. Owens will also serve as Glimmerglass’s 2012 Artist in Residence; as such he will not only take on the leading role in this production, but will participate in off-stage musical programs, educational talks and serve as an all-access mentor to the members of the 2012 Young Artists Program. The company's upcoming 2012 Festival will take place in Cooperstown, New York and will run in rotation July 7 through August 25. Next up for the company is GLIMMERATA!, the 2012 Spring Gala on April 10 at The Metropolitan Club in Manhattan to benefit the Festival’s Young Artists and Summer Internship programs.